First things first: this is not, repeat not, Eden Lake (whatever the packaging may very deliberately imply). That was a clever film that punched well above its weight and stands up as a classic of modern British horror. 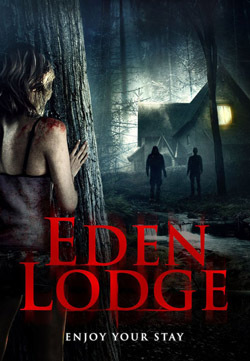 Eden Lodge, on the other hand, is a low budget slasher movie that offers little that’s original and even less that’s interesting. Go there if you must, but don’t expect the stay to be pleasant. Shot in 2012 but not released until three years later, Eden Lodge is a thoroughly blah production; neither bad enough to be of note nor good enough to merit particular attention. The plot harks back to the heyday of 1970s style horror (there’s a touch of Peter Walker to it all, and it’s not hard to picture Shiela Keith in Mrs. Wilkes role), but it’s all so familiar and the twists are so heavily signposted that it’s unable to be anything more than the sum of its rather meager parts. It looks fine for a low budget production, but the characters are banal, the acting poor and the violence gratuitous.